We are not a product of our circumstances; we are a product of our choices and everything results from the choices we make. This is true in life as well as in our real estate business. 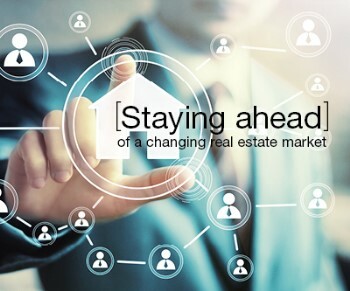 The real estate market in many areas of Canada is changing. Some people blame market shifts for a downswing in their business. They are in shock and believe the market did something to them personally. However, there is a group of individuals - really intelligent individuals – who stay ahead of changes and not only survive but thrive. These individuals always have a thirty thousand foot view of the market, a two thousand foot view, a street level view and they keep a perspective on themselves so they can pivot and change on a dime. First up, the thirty thousand foot view. Pay attention to news media you trust and to reports from the Canadian Real Estate Association. Follow them on social media. Seek out national and international economists and pay attention to the real story behind the trends about which your clients will ask. Not all trends impact every market but educating yourself in this way will help you to become a good forecaster and alleviate your clients’ real or perceived concerns. Next up, come in a little closer with a two thousand foot view. Gather a group of trusted advisors for your real estate business with whom you communicate regularly and who work on the business but not in it. I call them your “Dirty Dozen”. Seek out mortgage brokers, bankers, insurance brokers, city councillors, attorneys, home inspectors, and so on. Follow up with them every four to six weeks. Always offer value before you ask for something in return, promising to share anything of significance in the real estate industry and asking what’s changing in theirs. At the street level view, pay attention to your local real estate board. Know your board stats such as days on market, affordability in the neighbourhoods you serve, month-over-month and year-over-year trends, housing supply and demand, etc. And finally, take a hard look at yourself and your systems. Ask yourself two important questions, what are you best at and what do you want to be known for. What do you really love to do? Review your follow-up and communications systems. Depending on the survey you read, between seventy and ninety percent of home buyers or sellers would use the same agent again, but only eleven to twenty percent actually does. It is critical to provide value to current, past and future clients to stay top-of-mind. I remember being in the United States in 2006/2007. I could feel the market shifting. The agents who were on top of their game made friends with Fannie Mae and Freddie Mac. They connected with asset managers and learned how to work with foreclosures and short sales. The second wave in the economy saw savvy agents taking advantage of an influx of first time home buyer, investor and international business. They saw the trends and pivoted quickly to seize the opportunities presented by the market shifts. People will always move; their jobs change, they marry or divorce, they add kids or become empty-nesters, or they want to take advantage of the changing market. Confidence comes from competence and competence comes from knowledge. By proactively educating yourself with a high level view, a street level view, and sharpening your own saw, you can stay ahead of the market shifts and in control of your business.